It is estimated that around 25000 people in UK have taken the jump, and abandoned dry land and the heady UK housing market for a better quality of life on board a boat. Humans are not naturally suited to a life on the water so anyone considering moving on board a boat should test it first by trying a canal boat or motor cruiser holiday. Boats are typically smaller than houses, for example, and the confined spaces and limited storage space may take some adjustment. There is a vast array of boats available but for living aboard this can be divided into two key choices – stationary fixed houseboat or a proper boat. Fixed house boats are for people who enjoy the experience of living on the water but do not want to give up the stability and convenience of living in a house. A proper boat is suited for people who love the activity of boating and who don’t just want somewhere to live in but the freedom to take their home on their travels with them. Narrow boats are a particularly popular example. Fixed Abode or Continuous Cruising? Most boat dwellers live in a vessel with a permanent mooring where it can rest when not exploring. However those attracted to the water by the nomadic lifestyle of cruising from place to place, setting up home as they please, can live the life of a ‘continuous cruiser’ where they never stay for more than 14 days in one location. A permanent moorer will first need to secure a residential mooring from either a navigation authority or an independent provider. There is a limited number on each of the UK’s waterways and with certain parts such as London and the south east there is often a waiting list. In order to be issued with a waterways licence it is standard to have arranged a permanent mooring. However by being a continuous cruiser a boater can bypass this ruling. This lifestyle does not suit everyone, particularly those with employment responsibilities in one location. On average the costs associated with living on a boat should be well below those of living on land, as there are ample modestly priced vessels and moorings available. A good place to start researching prices for a vessel is at buyaboat.co.uk where it is possible to find a decent standard vessel costing somewhere in the region of £20,000 - £25,000. As with any accommodation it is important to carefully consider the options and bear in mind such factors as facilities, headroom and space, layout and, most importantly, the condition of the boat. Living costs are generally fairly low for boats, largely due the smaller size of the living space. Many vessels use typically economical heating options such as diesel, gas, wood and coal burners. Electricity is charged at the standard rate although this can be offset by solar or wind power, thereby reducing the costs further. House boats present some difficulties in securing a mortgage, unless they offer the security of a fixed dwelling. The best option is to consult companies that specialise in marine finance. Marine mortgages differ from normal mortgages in being typically restricted to a maximum term of 15 years and consequently have higher interest rates. Personal loans offer a better option for boats costing up to £25,000. These can be paid back over five, ten or fifteen years and the interest rates are normally lower than those of marine mortgages. Insurance rates vary according to the size, type and age of the boat, whether it is used for travelling in, whether it is used on inland waterways or at sea as well as the level of the owner’s boating experience. Most boats that occupy the UK’s network of canals and rivers will require a licence from the local waterways authority responsible for that channel. Residential boaters may also require a residential licence depending on the mooring. Likewise on most waterways boats will need to be tested for safety every five years as part of the Boat Safety Scheme. 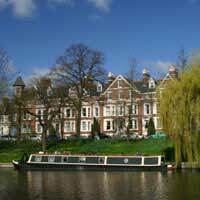 Officially if the boat is the main residence then the occupiers are liable for council tax. At the moment this is payable at Band A, the lowest band. However this may only apply if the resident stays at one particular permanent mooring and so boat dwellers that continually move around are not liable for council tax. In order to join the interesting and diverse community of boat dwellers it is important not only to share their passion for boats and the water but be well informed of the ins and outs of this alternative lifestyle.